Seasonal downpours in the region cause frequent landslides and floods and kill dozens each year. Ocean heat is a key indicator of global warming and a new system for measuring heat has revealed that the old system was out by about 40%. "They say this is a once every 1,000-year flood and we've had two of them in two years", says Governor Larry Hogan. Floods from seasonal rains hit as the East African nation was recovering from a devastating drought last year. Britain has suffered a pattern of severe flooding over the past decade linked to an increase in extreme weather events. 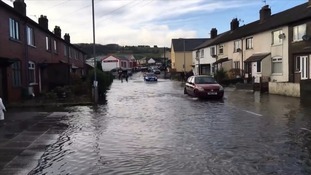 Heavy rain has caused widespread flooding and travel disruption across north west England and North Wales. Hundreds of residents in Cumbria and Lancashire saw their streets turn to rivers in the worst flooding seen in the area in generations. Heavy rain brought severe disruption to cross-Pennine train services, with the main Sheffield to Manchester line remaining closed on Tuesday due to flooding and fallen trees. Passengers on one of the last services into Sheffield said staff reported several problems on the line, including landslips and standing water. Meanwhile, West Yorkshire Fire and Rescue Service said it received over 70 calls about flooding on Monday evening. Further north, North Yorkshire Fire Service said it rescued eight people from cars on Monday evening, as crews were called out to 22 flooding incidents. Fire crews in Greater Manchester were called out to 157 incidents as a storm hit the region on Monday evening. Call handlers dealt with around 230 calls between 4pm and 9pm. Floodwater trapped Stalybridge residents in their homes, with firefighters arriving around 6pm to give advice to people stranded. Later in the evening, a water unit carried two couples to safety after the ground floors of their homes became submerged in floodwater. MeanwhThe Well-I-Hole Bridge in Greenfield, Oldham, was closed due to fears that it might collapse. Oldham Council also reported a culvert had collapsed on Beal Lane, Shaw. Overnight torrential downpours forced passengers onboard a ferry in the Irish Sea to spend the night in howling gales off the Welsh coast. The Stena Europe ferry which left Ireland at 9am on Monday with 87 passengers and 59 crew, was unable to dock at Fishguard, Pembrokeshire, due to "extreme weather conditions". After a second unsuccessful attempt to dock, the crew decided to stay at sea overnight. A third attempt to dock is scheduled for midday on Tuesday. Wind and rain will continue to batter parts of Britain on Tuesday, threatening further travel disruption and chaos. A total of 75 flood warnings commanding immediate action were issued to parts of the north west, north east, south west, midlands and East Anglia on Tuesday morning along with 217 flood alerts across the country.